Users (i.e. app-users) are the people authorized to sign-in to the app by the account Administrator (i.e. you). Once signed in, the specific Services they are authorized for will be downloaded to the app on their mobile device. Click on the ‘Users’ link on the top navigation menu. Then click “Add a User”. Choose a username and password for your user. [OPTIONAL] Authorize the user for any or all of your services. 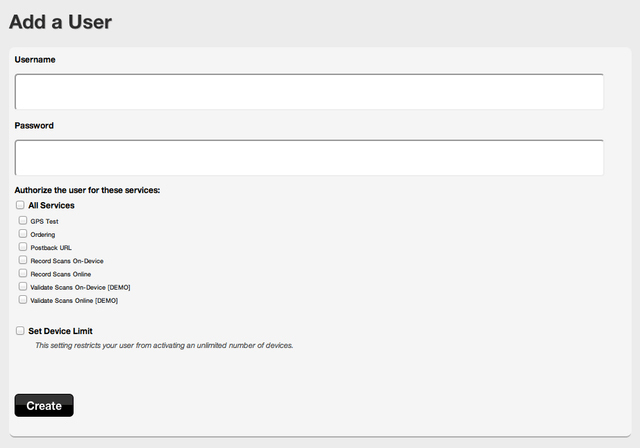 (You can also add services to users later, illustrated here). Remember that users mean nothing unless they are authorized to use a service! See instructions to upload users via CSV here.